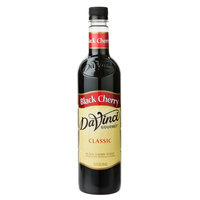 Choose from over 60 classic flavors, and discover the rich taste and quality consistency in each and every DaVinci Gourmet product, including this classic black cherry flavoring syrup! DaVinci Gourmet flavoring syrups are made from pure cane sugar to complement your beverages without overpowering them with too much sweetness. They are specially formulated to resist curdling in milk and hold up well under heat, making them the perfect choice for espresso-based drinks, brewed coffee, or tea. You can even use this syrup to create Italian sodas, black cherry bellinis and margaritas, or for drizzling atop your cheesecakes or baked goods for the perfect finishing touch! Black Cherry is one of my favorite Davinci flavors! It makes amazing Italian Sodas! It is a genuine, rich black cherry taste and does not taste artificial. It is sweet with just a hint of tart but isn't too sugary tasting. It packs A LOT of flavor in just a small bit of syrup and goes a long way. Fantastic value for an excellent flavor. 5 stars for sure! Great for both coffees and italian sodas. It has a strong cherry taste and is slightly more natural tasting than most black cherry flavoring I've come across. I enjoy this over regular cherry flavor. Our customers (and me!) love this black cherry syrup. We use it to make black cherry coke and we think it's better than regular cherry coke. It's also great for iced tea and lemonade. We use this black cherry flavoring syrup for making Italian sodas or cream sodas. It's one of our most requested flavors and we carry a large variety of the flavoring syrups. I love davinci flavoring syrups. They are always delicious and this one was no different. I will definitely be ordering some of this stuff again really soon! I love the bold, strong tastes of black cherry and was thrilled to try this syrup. It is great for making Italian style sodas at home. I am not quite sold on this product. I generally like DaVinci syrups, but this one has a bit of an artificial flavor, although it does intensely taste like black cherry. A very strong cherry flavor with this black cherry syrup. Perfect for flavoring beverages like teas or lemonades. Also great for flavoring and coloring cupcake frostings and batters. All of the DaVinci Gourmet fruity flavors are perfect for adding to lemonade or making Italian sodas. I also like to use them for baking to flavor my batters and icings. Great quality! It taste like black cherry, its a good flavor to keep on hand. I really enjoy it when I make myself an italian cream soda. It tastes like black cheery flavoring. This is good for black forest desserts. It enhances those treats to make them even better. I prefer baking with this flavor. Tastes like the real black cherry fruit. Used in my lemonade( also tried banana sryup with it for a twist of fruit blends) , water, white chocolate carmel cspachino and even on my tipila fish in the crock pot.! This makes a great cherry coke as well as to flavor our shakes in our coffee shop. it is a nice way to boost sales with offering flavor shots to our soda sales. I use this syrup to make homemade Black Cherry Soda. It's an extremely successful item, and this syrup actually has the perfect balance of sweetness and flavor for our recipe. Fast reasonable shipping from WebstaurantStore.com, and great customer service from David Timm when placing the initial order. Very pleased. During my Annual Little Italy Festival, I found that out of ALL the flavors I bought. (Amaretto, Apple, Black Cherry, Peach, Strawberry, and Watermelon) that Black Cherry was a hit! I, myself tried the product and it was wonderful.